Police are hunting a gang of ATM raiders after a smash and grab raid in a sleepy Deeside village. The culprits left a trail of wreckage in their wake after they used a stolen forklift to rip the cash machine off the wall of the Scotmid grocers on Craigour Road in Torphins. The brazen raid took place at 1.30am and did not escape the attention of villagers, one of whom took brave action that may have provided the police with vital information. Before the group – which appears to have consisted of three men – could flee the scene, they were confronted by a local woman. She ran towards them and began taking photographs of the robbers and their getaway vehicle. Moments later, the thieves took-off without harming her, with the stolen machine in tow, but abandoned their haul a short time later. Police discovered the ATM – apparently unopened – lying in the road around a mile outside of the village. A gold Chrysler vehicle was found alongside it, while a stolen blue Ford Galaxy was left behind in the village. Officers were unable to confirm if the Chrysler was also stolen, but said that a blue Mini One had been taken from area overnight and is yet to be found. It is thought the thieves made off by car, though it is not clear whether they were met by accomplices before leaving the scene. 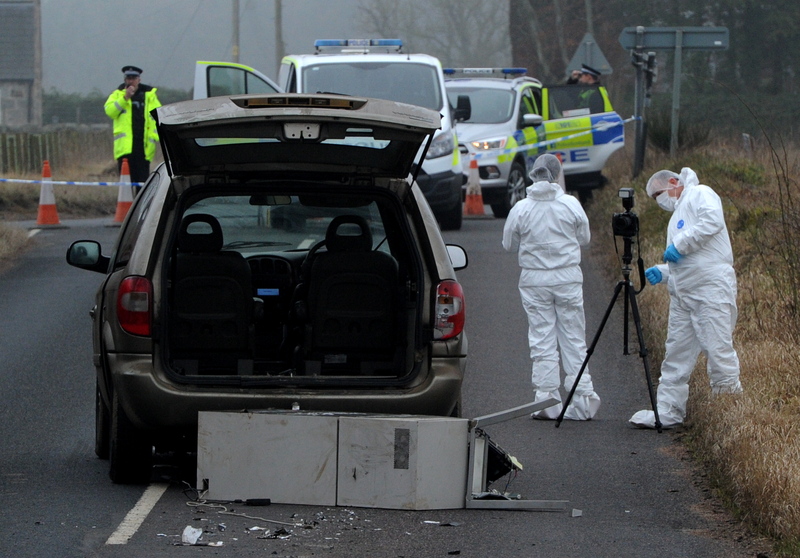 Forensics at the site where the car and ATM were dumped. Police were yesterday still trying to determine how much money was inside the ATM when it was stolen. A video was widely circulated online which showed the “brave” woman confronting the perpetrators, taking photographs of the individuals and their car before they took off. Detective Inspector Fionnuala McPhail said it was “obvious” some organisation and planning had gone into the crime, but called their attempt “crude”. “I’d like to extend my thanks to the community because they have been exceptionally helpful,” she said. “They have been very brave by assisting us with our inquiries by taking those photographs and videos. “That has been really super for us as a starting point. “She (the woman in the video) has been very brave, but what I would like to add is that at no point during this incident has there been any form of threat or violence towards the community at all. “There doesn’t appear to have been any direct threat (in the footage) or direct risk to anybody. Police yesterday sealed off the shop, the road that runs through the centre of the village and the area where the cars were dumped. Forensic teams in white suits scoured the outside of the shop for clues, while officers re-directed traffic, and were also highly visible where the cash machine was dumped. Children at Torphins Primary gathered at the school railings to look on at the “chaotic” scene. And the digger, which had been stolen from a building site nearby, was parked on the pavement outside the shop with its engine still on and lights flashing. DI McPhail said they would be reviewing all of the footage and images of the incident as well as CCTV. But said it was not clear how far the gang fled or whether they were from the surrounding area. “In previous incidents there have been people travelling into the area to commit this type of crime, so that’s possible, but I can’t rule out the possibility of it being locals at this stage,” she added. 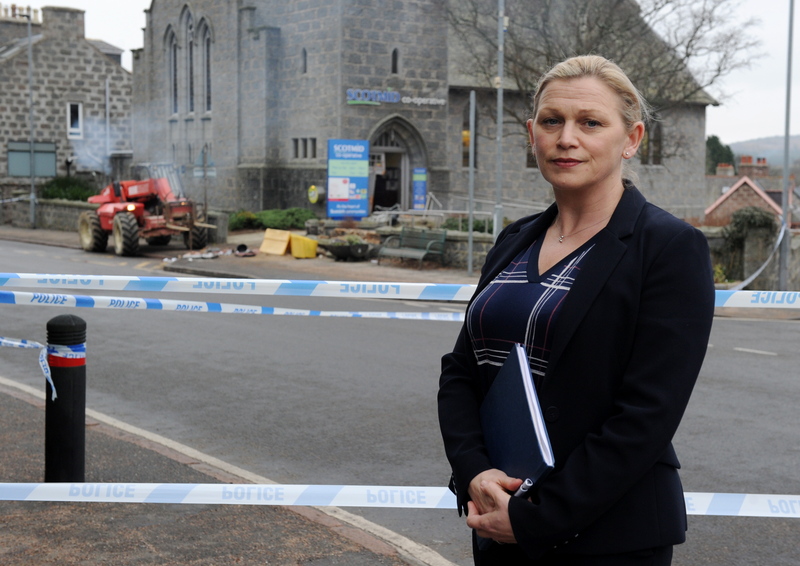 DI McPhail appealed for anyone who had seen both cars in the local area in the days leading up to the crime, or anyone acting suspiciously to come forward. Anyone with information on the incident should call 101.